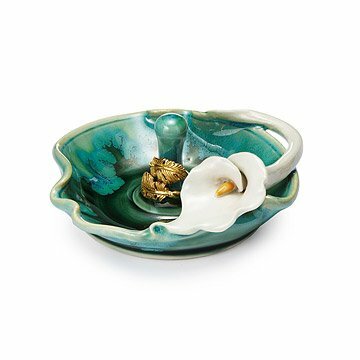 This elegant dish has a spindle for holding your rings, and is accented with a hand-sculpted lily. This handcrafted ceramic dish captures the lush beauty of a verdant garden, while also keeping your rings close by for easy picking. Creator Kristin Robran first spins her earthenware on a potter's wheel, but then hand-shapes the rim of the dish into an organic, leafy ripple. The dish is given a mottled green glaze that evokes the richness of rain-drenched foliage. On one side of the dish blossoms a hand-sculpted lily, looking elegant and serene. A spindle placed in the center of the dish keeps rings right where you need them, while the space around it in the dish is perfect for earrings and other small treasures you need to keep track of. Made in Wisconsin. Raised on a rural Wisconsin farm, I spent my youth continuously immersed in a beautiful natural setting. As time passed I developed a great love for collecting leaves, berries, flowers, and other organic materials. The collection of my childhood remains alive today in each piece of pottery, providing the viewer with a functional, yet decorative piece of art. My work begins with a simple lump of clay. Thrown on the potter's wheel to assume its basic shape, the vessel is hand altered to help it attain a more organic contour. A sculptural element is added to each piece, serving to remind the viewer of the natural beauty that surrounds us daily. This item is so beautifully constructed - big gratitude to its creator. It's such an elegant piece of "art." The ring holder is gorgeous! I love the color and the quality of this hand made piece. It was a little larger than expected, but I did not read the dimensions posted. If you need a unique gift for a special woman, buy this. You will not be disappointed. Beautiful and functional. Exactly what I expected. Arrived on time and intact. I gave this ring holder to one of my best friends for Christmas and she absolutely loved it! It was bigger than I thought for just a ring holder, which ended up being good because she used it for her bracelets too. It was perfect for her! Yes I would buy this porcelain lily ring holder again. This is the perfect ring and jewelry holder for when my wife needs to take off her rings and jewelry. I bought my mom another jewelry holder on this site that she loved. This one is the perfect compliment for her rings! I would consider purchasing as gifts for other friends. Friend is using for her rings.